All Lace Humbuckers and Sensors are passive and do not require batteries. 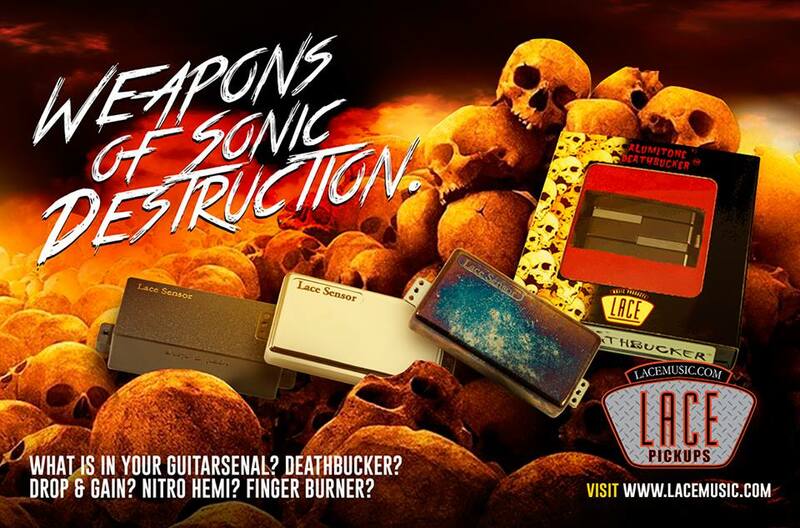 Lace Man O' War & Alumitone pickups are available for sonic perfection. 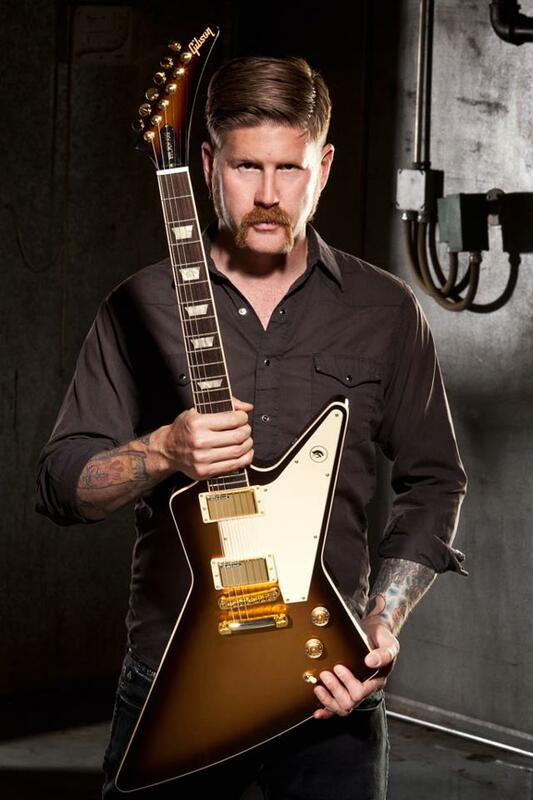 Bill Kelliher's musical career began in earnest as a member of the Rochester, NY, death metal band Lethargy alongside drummer and lifelong bandmate Brann Dailor, who would go on to join Kelliher in the psychoactive noise-rock outfit Today Is The Day. After moving to Atlanta, Kelliher and Dailor met then-Four Hour Fogger members Troy Sanders and Brent Hinds at a basement High On Fire show. The four musicians soon joined forces in Mastodon, a band that has since become one of the preeminent forces in heavy music. After unveiling their debut EP and two highly acclaimed albums-2002's Remission and 2004's Leviathan-via Relapse Records, Mastodon signed with Reprise and have released three more devastating full-lengths. In 2010, they recorded the soundtrack to the Warner Bros film Jonah Hex, starring Josh Brolin, John Malkovich and Megan Fox. Their latest, The Hunter, reached #10 on the Billboard chart and was named "Album Of The Year" by Metal Hammer, Kerrang!, Rock Sound and Classic Rock magazines. As if playing guitar for Mastodon weren't enough, Kelliher recently joined Primate, an Atlanta-based "thundergrind" outfit featuring Brutal Truth vocalist Kevin Sharp. The band released their debut, Draw Back A Stump, in 2011. Over the course of the last several years, Kelliher has been recognized as one of the finest guitar players in heavy music. 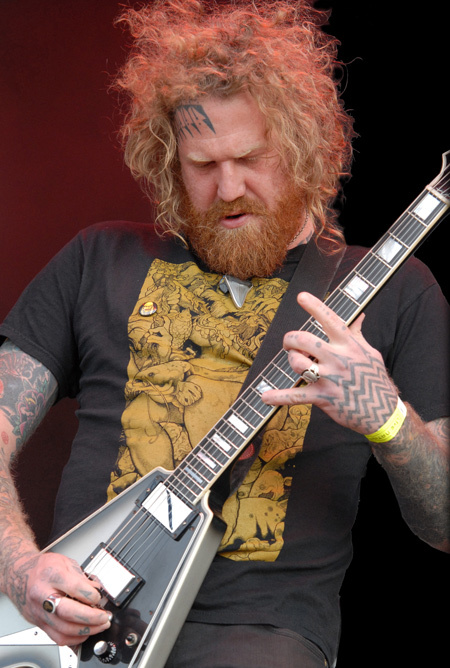 He and fellow Mastodon guitarist Brent Hinds were awarded Metal Hammer's Golden Gods award for "Best Shredders" in 2007. The duo also appeared on the cover of Guitar World magazine's 300th issue alongside such six-string icons as Tony Iommi, James Hetfield and Angus Young. To help perfect his screaming metal tone, Kelliher used Lace Nitro Hemis, but now uses his NEW Dissonant Aggressor signature models. Brent Hinds is an American guitarist/singer best known as a member of the Atlanta, Georgia metal band Mastodon, in which he shares guitar duties with Bill Kelliher and vocal duties with Troy Sanders and Brann Dailor. Hinds is also lead guitarist/singer for the surfabilly band Friend Without a Face, and is involved in other projects, including classic rock bands The Blood Vessels, West End Motel, Four Hour Fogger, The Last of the Blue Eyed Devils, Giraffe Tongue Orchestra, and Legend of the Seagullmen. In Mastodon's early years, Hinds would work as a full-time carpenter when not touring to promote the band. Hinds left Alabama for Atlanta, Georgia in pursuit of a music career. It was at this time that he met Troy Sanders, a future member of Mastodon. According to Sanders, he "lived in his van for the next five years", becoming a member of Sanders' then band, Four Hour Fogger. The first practice he attended with this band he allegedly "showed up so wasted he couldn't even play". Once Four Hour Fogger fell apart, the two stuck together, eventually meeting Brann Dailor and Bill Kelliher at a High on Fire concert in "their friend's basement". The four began a new musical venture with then singer Eric Saner, touring the southern USA, working 40-hour weeks and committing to the band in their spare time. The band's mainstream success would ensue after Saner left the band, pushing Hinds to the forefront not just as a guitarist, but as a vocalist also, the duties of which he would share with Sanders. To power his NEW premier Epiphone Signature Model, Brent chose Lace® USA Brent Hinds signature Hammer Claws™ Humbuckers which were designed by Brent to unleash a bright attack with a smooth midrange crunch along with balanced lows with highly responsive dynamics. Brent's Lace Hammer Claws pickups excel at all gain levels from clean to face-melting distortion. 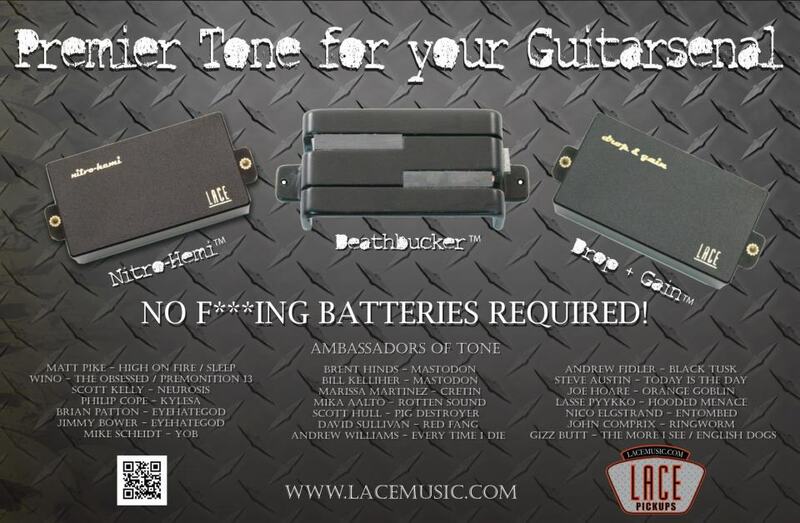 We are Hinesite Distribution Ltd the official UK distributor for Lace Pickups USA. We keep most models in stock. In the unlikely event we become out of stock, we can get replenishments from Lace USA very quickly. Our Lace Pickups can be ordered through any Music store or Luthier in the UK or ON-LINE from our friends opposite. 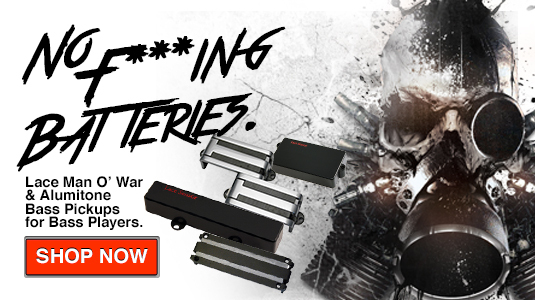 *OUR 5YR WARRANTY IS ONLY APPLICABLE IF PURCHASED FROM A UK DEALER. If your purchase is from a dealer outside the UK we will NOT COVER THE WARRANTY should you experience a problem with your pickups.